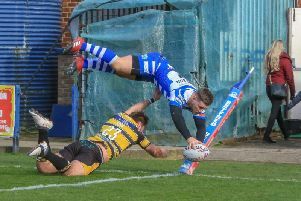 Fax coach Richard Marshall will be looking for his players to front up all over the pitch when his side travel to take on unbeaten Championship leaders Leigh Centurions on Sunday (3pm). Marshall plans to nullify the threat from Leigh’s talented half-back pairing of Ryan Brierley and Martin Ridyard while hoping his pack will match the strength and intensity of the home forwards. He also pointed to the abilities of his own Scott Murrell and on-loan half back Danny Craven to impose themselves on a game which, Marshall believes, will produce another tight encounter. Games between the two are historically highly-charged affairs and Marshall expects Sunday’s game to be just as intense. “They are usually spicy games and this is one we are really looking forward to,” said Marshall. “Leigh are a very good full-time outfit who play an exciting brand of rugby. They also knocked Salford out of the Challenge Cup so they have to be respected. With both sides going into the game on the back of a win, Fax with a 40-6 success over Doncaster and Leigh 32-28 victors at Dewsbury, confidence in both camps will be high. However, the Fax boss knows nothing less than a fully commited performance will suffice if Fax are to return with anything from the Leigh Sports Villlage. “We will have to match Leigh for 40 minutes and then back that up with another strong 40 minutes,” added Marshall. “I thought we dropped off a little against Doncaster and we cannot afford to do that on Sunday. “Leigh have improved since we lost narrowly to them back in February. I thought that was a game that could have gone either way but they won it with a late breakaway try. “Having said that we have also improved. Our pack have dominated most of the other packs we have faced this season. Marshall has no real injury issues while Steve Tyrer is expected to be up for selection after being ruled out for a month with a knee problem. “We missed Steve’s goalkicking against Doncaster so it would be a massive bonus to have him back,” said Marshall. “He will have had a full week of training so hopefully he will be up for selection.